Carl found it here; it was made by The Bleeding Heart Bakery, and is one of the nicest Rickroll cakes I've seen. I think the decorator really captured the hair height and patented "Rick Astley Dancing Elbows" quite well, don't you? And while I'm posting April Fool's related news, I've gotta give a birthday shout-out to my big brother, Ben. Yes, my brother was born on April Fool's. And if you think I didn't get some serious teasing-mileage out of that growing up, you are quite mistaken. [wicked grin] Happy birthday, Ben! *After today, though, all bets are off. Even if I don't get Rick-rolled today, (and I'm gullible enough that it just might happen) I'm going to have that song stuck in my head for the rest of the day. I have actually been Rick Rolled. That crazy Perez Hilton! But I don't mind. I'm old enough to remember Rick Astley when "Never Gonna Give You UP" was a new hit. Heck, it's on my iPod. So, yeah, I'd pay for that cake. What the heck. I want the elbow piece!!! I was Rick Roll'd by Google today... burn. My brother was born on April 1st too!! And he's the baby of the family. You're right, serious teasing material. Ha Ha....I already fell for a Rickroll today. You think I'd learn. The cake is lovely. The hair is spot-on. I would totally eat this cake. The only thing that would make it better is if the cake were styrofoam. My father's an April Fool - and he swears he can spot a styrofoam cake at 100 paces. My cousin's birthday is April 1st. My family tells the story of my uncle calling everyone saying "It's a boy!" and everyone saying "Yeah right, ha ha April Fool's" and hanging up on him! wow. rickroll is SO over! the cake is neat but....rick roll...sigh. Hey kind of looks like if Rick Astley and Beavis had a love child! I have to say I have never been Rick rolled, so all of this was new to me..LOL Great blog, as usual! I want that cake ... but I want Rick on an Apple OSX computer, not a Windoze. okay, how is it that i loved Rick Astley in high school, and i've never seen this supposed rick-roll internet thingy? i know i'm way out of touch, but this proves it. i also don't twitter. yikes! I'm surprised the 'here' link wasn't a rick roll. I love being rick rolled. Thank you Cakewrecks. I'm a middle-aged mom who doesn't get out much and you are my go to link for pop culture references. How did I go this long without knowing about the Rickroll. I lived through the Astley era, had the smooth dances moves, could complete a pretty fair hair flip ala Rick's bitchin' hot dancers, but was living in ignorance until today. You make me laugh. I am indebted. I'm hungry for cake. "Never Gonna Give You Up" is my ringtone! You should see the smiles and laughs I get every time I get a call out in public. My daughter calls me when we are out just to see everyone's reactions. It's MY birthday today too! Yay for all us "fools"! I love this cake, so funny! LOL, I should ask for one of these for my friend Dan-it's his birthday today! =) Gets points for execution, that's for sure. I've never been the victim of a Rickroll myself, but I wouldn't be opposed to it. I was a RA fan back in the day. =D Brings back memories of high school! I've been Rick Rolled once, but I love the song so it was all good hehehe. And I agree with Paige - it really does look like Rick Astley and Beavis's love child. I was so bummed today. I spotted a Wreck...and I DIDN'T HAVE MY CELL PHONE WITH ME TO GET A PIC!!!. Just damn. You have no idea how rad it was to have everyone singing along then! I must be living under a rock because I have never heard of Rick Astley OR the term "rickrolled". I had to Google it. I think I'll go back under my rock now and put on a Stevie Ray Vaughan CD, which is what I was listening to in 1987.
erm.... did the record stick? "never gonna give/never gonna give"
Was there not room for "you up"? That is the most awesome thing I have ever seen. I'd love to have been there to see everyone's faces when they took the cake out. Rolled! All I gotta say is that Rick Astley is a snappy dancer! Haha! 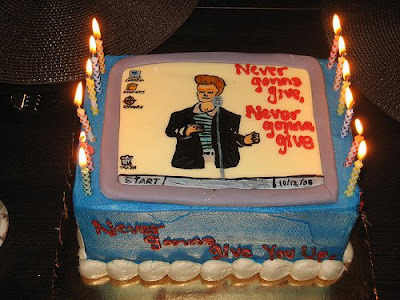 The only way to make a Rickroll cake even better would be to place the facade of a normal cake over it. You take that off, and BAM! You got cakerolled! GD it. I was not expecting Rick at all. Is it just me, or does ol' Rick look kind of like Conan O'Brian? Yeah!!! April Fool babies are THE smartest! Our son is 15 today, and he already knows EVERYTHING he'll EVER have to know (just ask him)!
! !Happy Birthday to Big Ben and ALL4/1 babies!! I remember seeing that video on MTV and muting it after the first 10,000 times...and needing a prescription sleep aid at night for weeks. So anyway, that cake is dated 10/12/08 (? 05?) --whatever--which means that *apparently* whoever got it couldn't ever give it up. Hi I found your site whilst looking for help in icing a cake on the web. I haven't laughed so much in ages, I have been crying with laughter, a combination of the cakes and your incredibly funny commentary. Thank you, thank you, thank you. I will be visiting your blog again soon, and telling all my friends to visit too. Amanda W. in the UK. As an april fools' baby, I think the joke is on everyone else! I never forget what day it is, so I never fall for jokes/pranks/etc. :D It's funny to watch people try, tho! My little brother was born on April Fool's Day. His name is Ben too! "... I think I'll go back under my rock now and put on a Stevie Ray Vaughan CD, which is what I was listening to in 1987." Mind if I join you under that rock? Stevie Ray Vaughan's stuff is some of my favorite music to listen to NOW. The cake was "one of the best Rick Roll Cakes" you've seen? Um...exactly how many of those things are out there? Somewhere on the internet, there must be a picture of a jelly-roll cake with "Rick" written on it. If not, I think I'll have to make one. Love your blog, I read it every day. Tell your brother I sympathize. My birthday is April fools day too, and I have had more than my share of jokes. You know what never gets old? The literal RickRoll. It has some language, but it's awesome. That cake is OK, but I would never order it. OK, so those of you who didn't know what a Rickroll was, did you watch the Macy's Thanksgiving parade?! Cartoon Network had RA on their float and Rickrolled the whole viewership! My kids thought it was hysterical, as is this cake!! I SO need to get one of those for my 13yo's next birthday. Yesterday was my birthday too! So please share my own birthday wishes with your brother. Word verification--Ressect: to dissect a second time. 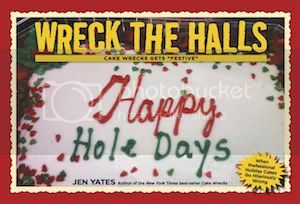 Cake Wrecks, a Role Model?! ?